Pregnancy cravings are in full force here in the Kurtz house. On this weeks menu, Nutella! Whether on a banana, apple, or just by the spoon full, I'm craving it! 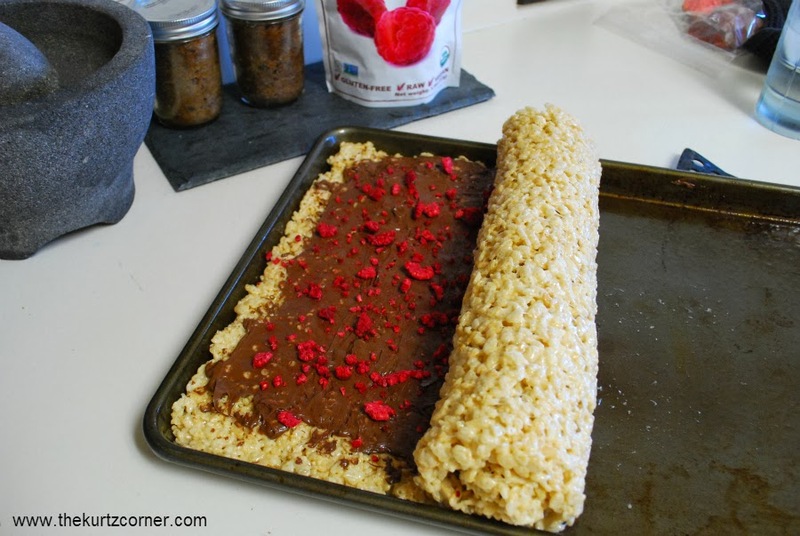 During a recent trip to see our friends in Austin we had our first taste of a Nutella Rice Krispie Roll Up, and boy was it good! It's so simple to make and the results are delicious. 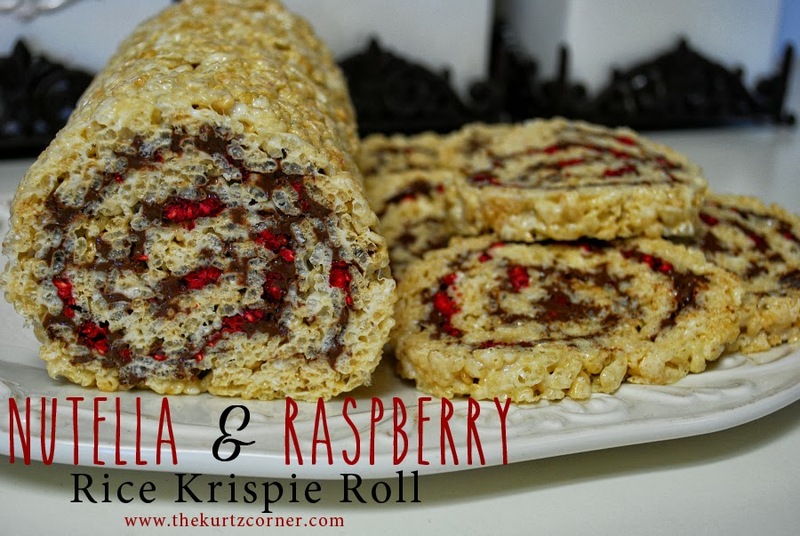 To jazz up my roll, I added freeze dried raspberries (purchased as Whole Foods). I LOVE anything chocolate raspberry, so I thought this would, of course, be magic! 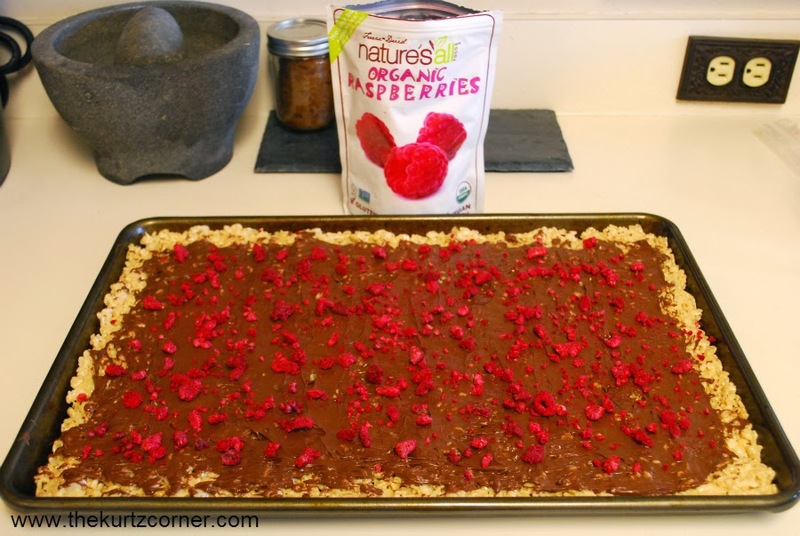 If you don't like raspberries you can throw in other freeze dried fruit or just keep it simple with good ole Nutella. I chose to use freeze dried fruit to avoid extra liquid from the fruit and I figured it would keep a lot longer...or as long as you can keep your greedy little hands off it! Prepare a large cookie sheet with non-stick cooking spray; set aside. In a medium pot, over medium low heat, melt butter and add marshmallows. Stir to combine and let marshmallows completely melt. Be sure to stir frequently to keep the butter and marshmallows from burning. While marshmallows are melting place the Rice Krispies in a large mixing bowl. Once the marshmallows are completely melted pour them into your bowl with the Rice Krispies and stir immediately until well combined. Quickly spatula mixture onto the prepared cookie sheet and spread with your hands to cover the entire surface. To prevent the mixture from sticking to your hands, spray your hands with some non-stick cooking spray before pressing the Rice Krispies into the pan. Trust me, it works!! 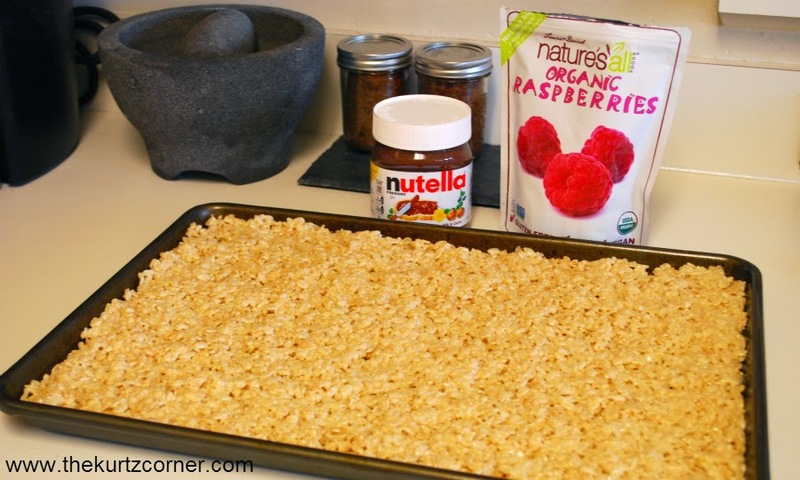 Once the Rice Krispies have completely cooled, use a rubber spatula to spread your Nutella. I used an entire small jar of Nutella. You can use more or less, but I thought this was a good Nutella to Rice Krispie ratio. Next, sprinkle on your freeze dried raspberries, as many as you'd like. 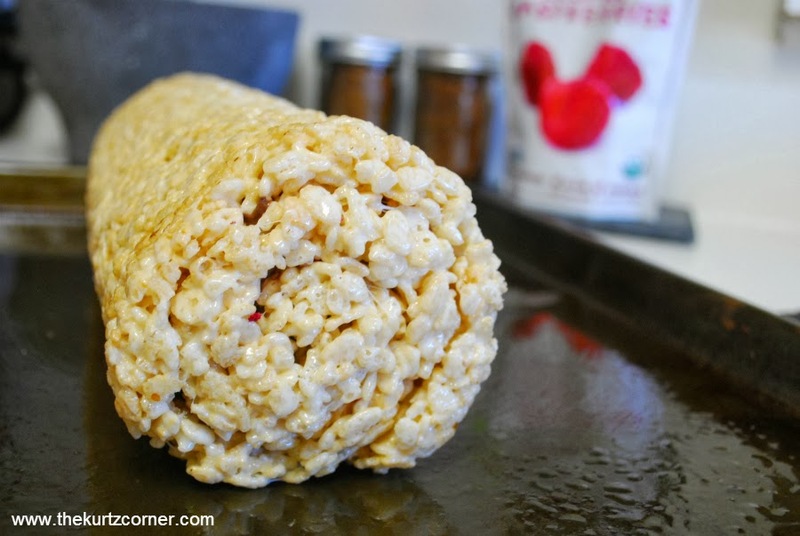 Roll your Rice Krispie up into log form. Just start at one end and roll. Using a large, sharp knife, slice your Roll into thin or think slices. Serve or store in an air tight container. Enjoy! Well, it's never a dull moment here in the Kurtz house. No ER visit this week, but I'm pretty sure I was having contraction...no, they were not Braxton Hicks, I'm talking menstrual cramps that radiated to my lower back. After feeling these for 2 hours straight on and off I called my doctor and headed in to make sure it was nothing serious. I wasn't dilated so everything was fine. We're not entirely sure what was causing the pain, but my doctor sent me home from work to rest, drink tons of water, and monitor the pain in case I needed to head to the ER to be monitored. The pain finally subsided and I haven't felt it since. All I know is this little fella is not taking it easy on me! I am sure it could be way worse and other women have it 10x harder than I do and for that I am grateful and will "take my licks" and endure because I know this little prince with be 110% worth it!! This week we are heading on our first dove hunting trip of the season. Yes, I know some of you are thinking, "hunting, while pregnant, are you crazy!?" and the answer is, no! Hunting is perfectly safe while pregnant. Dove hunting is super laid back, you sit pretty much the whole time. You're not climbing up trees or into hunting blinds, you're just sitting in the field. The sound from the gun isn't loud enough to even phase the baby. So, really the biggest concern is not twisting your ankle walking through a field. I'm sure some of you are still thinking, "but guns aren't safe, you could get shot!" and my answer to that is guns are perfectly safe as long as you know what you're doing, you practice safe habits, and pay attention to what you're doing. Just because I'm pregnant I refuse to lock myself away and not do the things that I enjoy (within reason of course). If anything, it's great exercise! This week I am feeling Peyton move so much! I'm even starting to feel him roll when I am laying on my side. Before I wasn't sure of the movement, if it was rolling or not, but now I'm almost positive that's what it is. It's such an incredible feeling! I have been very lucky to have no swelling (so far), no stretch marks which are hereditary and neither my sister nor my mother had them (feeling lucky on that one!) and my weight gain has been very steady and on the low end. Right now at 21 weeks I am up 12 pounds and hoping to stay under 30 pounds total. Here's to hoping!! I do plan to start heading back to the gym now that I am feeling much better and have more energy than I did in my 1st trimester. This week Peyton is about the size of a carrot, measuring about 10.5 inches from head to heel and weighing in around 10.5 oz. These are all estimates of course, based on the I'm Expecting app, we will see how accurate they are at my next visit with a sono. I know the majority, okay pretty much all of my recent posts have been pregnancy/baby geared, but I am here to say, yes, I am still crafting and I will be posting more about crafts and recipes, too, don't worry! 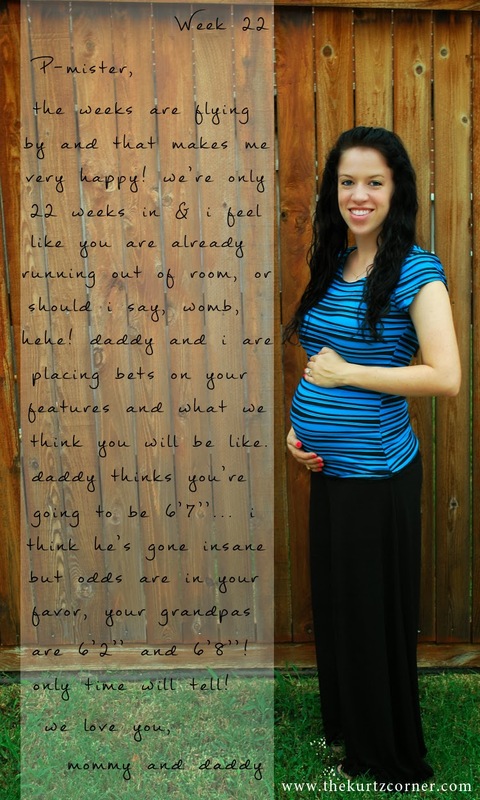 It hasn't turned into just a pregnancy blog. So, here is my first Fall craft for this season! It's still scorching hot here in Texas, so sadly I can't wear these just yet. But you know what they say about Texas weather, If you don't like it just wait a few minutes! I'm hoping that saying hold true and some cool weather heads out way soon! After browsing Pinterest, as I so often do, I was pining for Fall weather after seeing so many cute chunky Fall scarf and sweater combos. I love buying new scarves each year to accessorize with, but with a baby on the way, shopping for anyone but him is out of the question...well, not really, but I like to save save save, so why not make them on my own right!? 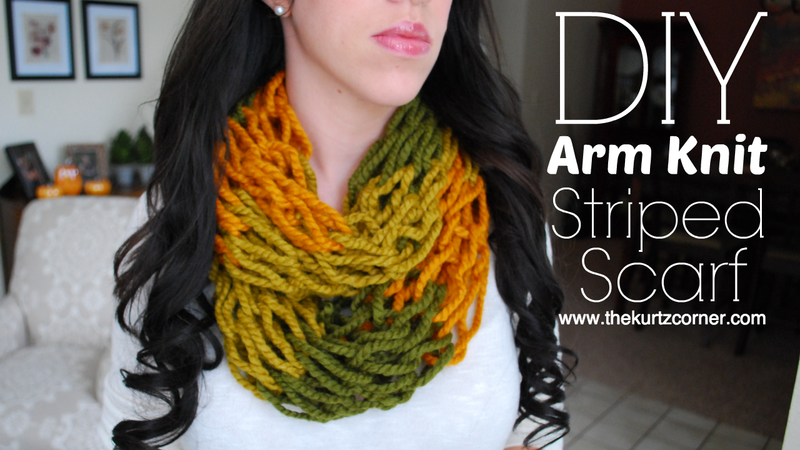 I found a really beautiful arm knit scarf on Pinterest from Simply Maggie which led me to YouTube. After watching a few videos I grabbed some yarn that I had sitting in my craft closet and got started! Since it was my first it took more like an hour instead of 30 minutes, but hey, it turned out darn cute! The second scarf I made was so much easier to make after doing it just once and I was able to make that one in thirty minutes. 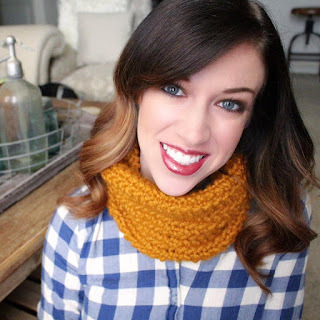 I shared my finished infinity scarf on Instagram and everyone loved it! I figured this would be a fun tutorial to share as we all gear up for Fall. This is the perfect craft to do on a rainy day, in the car while making the long drive to see family, or just anytime you have a free thirty minutes! This would make a great gift if you're on a budget and of course they're perfect for just you, because we can never have too many chunky cozy scarves, am I right?! Below is the video that I created and posted on YouTube. Hopefully it's as easy to follow as I think it is. If you have any questions feel free to comment and I will do my best to answer them! Have fun! - The tail goes around your thumb as you are casting on and will get shorter as you go which is why we start with a really long tail. - You can use 2 different colors! 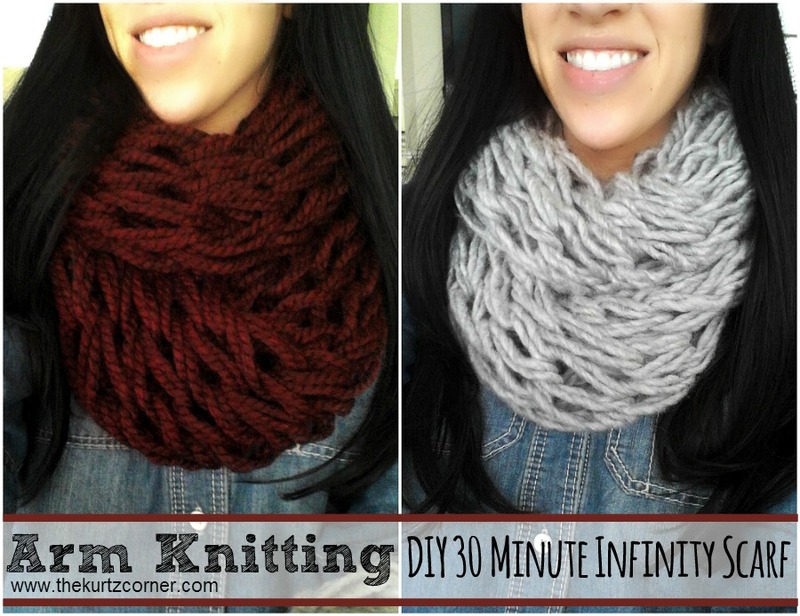 I had a few questions on how I combined the two ends of my scarf to turn it into an infinity scarf, so I created a follow-up video to show how I did this. Here it is below! Boy, oh boy...handling stress during pregnancy has definitely been a challenge. The stress of starting a new job and wanting to do the the absolute best I can, not let anyone down and on top of that worrying that I could end up in the emergency room again, ugh, I've hit my breaking point. It's all so foreign to me, too, because this is not who I am normally. Normally, things don't bother me and I don't stress. I may worry about normal things from time to time, but I am super laid back, I don't sweat the small stuff, and I laugh things (and people) off. I would say that I've developed some pretty thick skin over the past 8 years (going through college and the four years post grad), but dang man! These pregnancy hormones? Grab a freakin' life vest because the flood gates have been opened! I mean, I'm not crying over stupid weird stuff, these are legit worries of job performance and staying out of the ER. Although, I was sitting at the dinner table with my husband, it had been a great day, and I just look up at him and say, "I feel like I want to cry" haha! He looks at me concerned and ask why, to which I reply, "I have no idea!?" I really had no reason at all, my crazy, hormonal body just wanted to cry. Needless to say, I am trying my hardest to de-stress after work, take deep breaths when I'm feeling overwhelmed and of course the hubby is being super supportive. He may not always understand what I'm going through (how could he!?) but he tries his best to understand and help me cope. Aside from learning how to deal with this crazy stress I feel and the ER visit, the only weird thing I've had to deal with is developing oral Thrush. Weird right!? Normally, babies get Thrush, but apparently during pregnancy it's not uncommon to develop Thrush because all of the changing hormones. I had heard of it, but didn't really know what it was till the nurse at my OB/GYNs suggested that's what I may have after I called complaining of sore taste buds. It literally felt like I had eaten 100 pineapples or 100 sour patch kids and my tongue was raw from the acidity. Foods tasted weird and things that shouldn't burn my tongue did. A flippin' brownie made my tongue burn, absolutely strange! It was a super simple fix though, the Dr. office gave me Nystatin, which is safe for pregnancy and all you do is swish and swallow or swish and spit it out. I took it for a few days and was golden. So, if you're prego and you're mouth starts feeling weird, you may have Thrush, and that is totally normal and easy to fix! As you can see the bump is really starting to pop out, including my belly button lol which is half as deep as it was before I was prego. Luckily, I have no swelling so far, no stretch marks (yay!) and I've only gained 9 pounds (woo hoo!). Peyton is now the size of a small cantaloupe (ew) or banana (yum) depending on the pregnancy app you read lol. He is around 10 oz and measures around 6 to 6.5 inches from crown to rump. Seriously, I cannot believe I'm halfway done! I just wish it would hurry up and go by faster, I'm so ready to meet my little man :) Only 140 days to go! 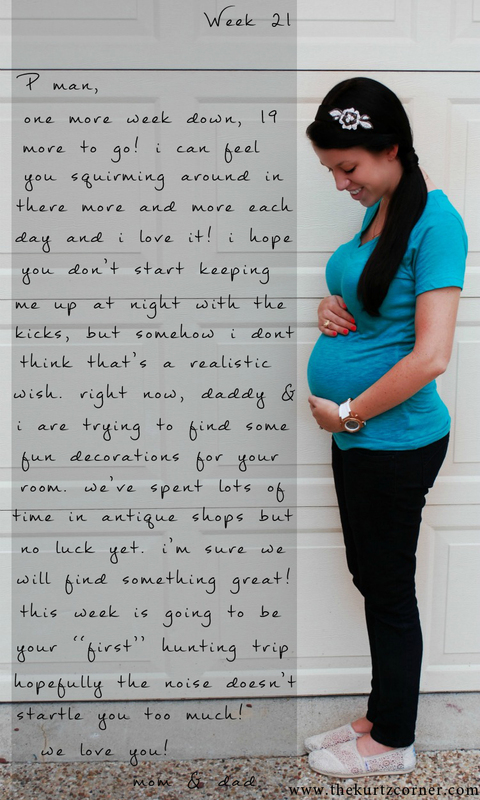 If this is your first time on the blog feel free to check out some of my previous pregnancy posts! I hope you'll stick around for the long haul! And yes, to all of my followers from pre-pregnancy, I WILL be posting crafts and recipes soon, it hasn't turned into just a pregnancy blog. Look out for some Fall DIYs, hopefully this weekend!